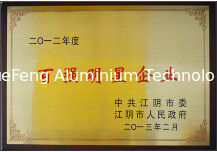 Wuxi Yuefeng Aluminum Plant Group has been awarded the title of "National Demonstration Enterprise of Good Faith in Product and Service Quality" for six consecutive years. 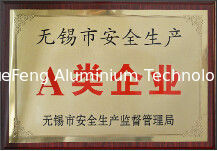 Yuefeng aluminum industry ranks the top 100 in the whole country with more than ten billion brand value. Yuefeng aluminum production and sales volume in 2018 has exceeded 16000 tons.